Do you have a sweet tooth? This festive season savors something different. You must have heard about this sweet, if not then you must be living under a rock, where the sunlight takes 100 years to reach. Hint: it is stuffed with the sweet filling of khoya. Yes, you guessed it right, the sweet is: Gujiya. This sweet is popular in North India and can be prepared in every occasion that too with mesmerizing ingredients like dry fruits, sugar, evaporated milk, etc. These ingredients can be bought easily from nearby market or you can use some of the grocery coupons in order to get cheapest dry fruits online on Big basket, Amazon, Flipkart, etc. 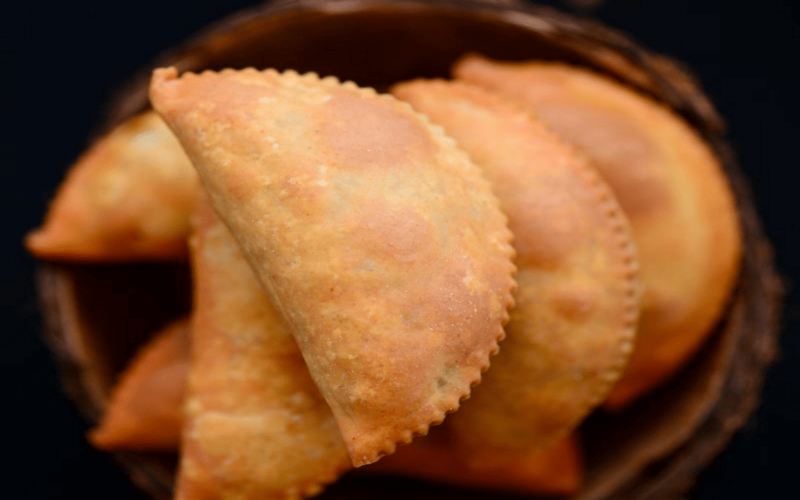 This sweet actually does not find any occasion, every home lights up with the fragrance of Gujiya but one of the prominent thing to know about Gujiya is that it completes the festive occasion of Holi, with its syrupy taste and nutritious filling is enjoyed by everyone. Take the all-purpose flour, whole wheat flour and also salt in a bowl. Heat the ghee in a bowl. Then, pour the ghee on the flour. Add water in parts, the amount of water will depend upon the quality and on the texture of the flour. Knead the dough till it gets firm. Then, cover the dough with a moist cloth and keep it aside for at least 30 minutes. Melt ½ tablespoon ghee at low flame. Stir the khoya continuously on low flame. The next step is to cook the khoya, till it begins to gather around itself. Now, switch off the flame and keep the pan down, let the khoya stuffing cool down entirely. Add the powdered sugar, cardamom powder and dry fruits, sieve the sugar if there are sugar lumps. Mix everything properly and keep the stuffing aside. You can check the taste. You will now have to divide the dough into two parts. Make a medium size log of the each part and divide them into equal pieces. Roll each parts in your palms to make the balls and place all the balls in the same bowl, cover it with a moist towel. Dust the rolling board with some flour, then roll each ball to a small circle which has the diameter of 4 to 5 inches. Don’t add too much of flour, if you are able to roll without the flour then its better. Apply water all over the circumference edge with the help of your fingertip. Now, place the 1 tablespoon khoya filling on the side of the circle, while keeping the edges empty. Don’t add too much of stuffing as it will become too difficult to shape and gujiya might break in the oil. Bring both the edges together carefully and join the edges. Trim the extra edges with the help of pizza cutter or if you have a gujiya cutter then it is better. The gujiya should be sealed well while doing this, if you want to bake gujiya then this is a good idea but it is not if you want to fry the gujiya. Prepare gujiyas in this way and arrange them on a tray. Then, cover the gujiyas with a moist cloth, it won’t let the dough dry out. Preheat the oven to 200 degrees Celsius, then brush ghee over the gujiyas in a uniform way. Place all the gujiyas in a baking try. Bake the gujiyas for about 25 to 30 minutes at 200 degrees Celsius, till the color become golden. Keep a check while baking gujiyas. Place them on a wire rack for cooling, once they are cooled store them in an air-tight jar. Heat the oil for deep frying in a pan or a kadai. Test the temperature of the oil, before you begin to fry gujiyas. Add a small piece of dough in the oil if the dough comes up gradually, then you can consider oil is ready. And if the dough sits at the bottom the oil is cold. If the dough comes up quickly then it is too hot. Slide guijyas gently one by one into the pan. Don’t overcrowd the pan. Turn them over carefully, deep fry the gujiyas till they are in golden colour. Fry all the gujiyas in this way and store them in an air-tight box. Follow these steps and you will get a dish that will take you the paradise city and it would be easy for you to woo your neighbours. This gujia dish will make you crave for more and even make you fall in love with cooking.